Finally: a new piece to show off! 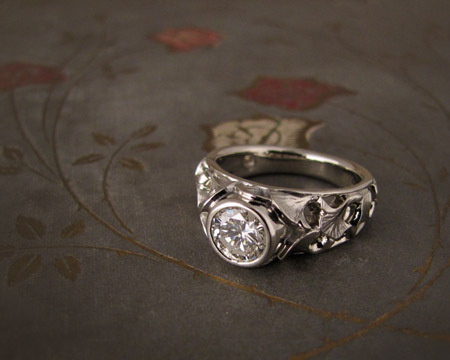 Carved tapered solitaire with scattered ginkgo leaves in 18K white gold. The stone is a 6mm family diamond sent to me by the client. The ring is a slight departure from my usual fare in that it has a very clean, symmetrical outline, but with a very organic pattern of ginkgo leaves arranged across the top. I’m very happy with how it turned out. 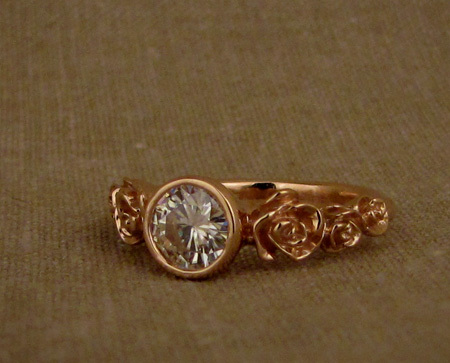 I took a ton of photos of the ring; click through to see them all! Oh hello there! I’m still here. I got slammed with Christmas orders (why I thought this would not be no big whoop, I have no idea) and then once I finished and shipped everything, I spent a month stumbling around with my eyes glazed over. I have some new custom pieces I made, which I’m very excited to show everyone. I just have to wait for the recipients to get them so I can post pics. 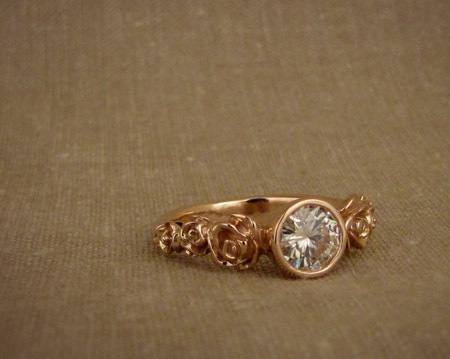 In the meantime, here’s one that is not necessarily a new design, but used a very unique natural color peachy-pink rose-cut diamond. Quite loverly! Man. 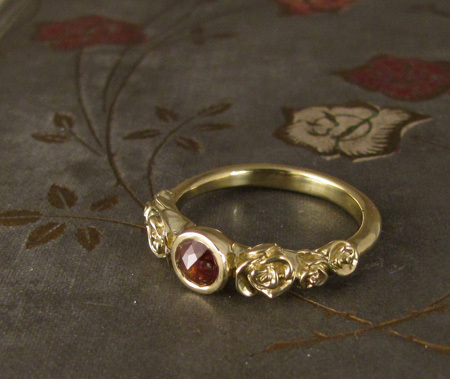 Nothing beats the color of 18K yellow gold. I always thought I was more of a white gold person but lately I find myself loading up on the 18K yellow.